We were early to school this morning, which, truth be told, is rare. Not that Annelise has a lot of tardies or anything (three, I think) but we usually pull into the car line with smokin' tires and Annelise has to, um...make a run for it. Nice, no? Recently, I've made a deal with myself that I will do my daily bible reading (I started following the read-the-bible-in-a-year plan again that I fizzled out on last year), bible study lesson (started a new book study on Ruth that's really good so far) and journal writing (trying to find the lost journaler within again) before anything else. So far this plan is working and I feel so much better knowing I've gotten the important *stuff* accomplished first. It would be great if I extended my little deal with myself to include exercise before I do anything else, but I'm not quite there yet. However, I can tell you that I had a short date with Jillian Michaels yesterday and plan to meet with her again today for another bout of pain energizing workout. I hadn't done The Shred in quite a while, having preferred my Beachbody workouts, but honestly, I haven't even been doing those (or at the most once or twice a month, which you know, doesn't actually yield the best results). Even though Jillian annoys me (Why so angry, hmm Jillian?) I like that the workout routine combines large muscle groups with smaller ones, throws in cardio and abs too in a short, effective workout package. I hope that doing this will be my gateway drug into regular (I'm a little scared to say daily) exercise again. And, just so you know, I don't tell y'all about my attempts to improve spiritually and physically to sound like I've got it all together because, hello, have you met me? All I'm doing is trying to do (and be) better. I fail a LOT and pout for a while and then I try again. And repeat. Case in point, take this past Sunday morning when I was getting ready for church. What started out as an innocent step onto our new scale before hopping into the shower led to a rapid fire downward spiral of my mood. By the time I wriggled myself into my knock-off Spanx, followed by my dress that was still too snug and tried to apply make-up to my by that time sweaty face I was in a state of self-loathing that could not be vanquished. I was also running late (no surprise there). I'm ashamed to admit that I gave up and decided not to go. You know that scripture about not giving the devil a foothold? (Ephesians 4:27) Well, I did and he ran rampant with my insecurities and I allowed him a victory in that battle. I need to remember that. And practice it. Twenty-four mornings of the shred. what is the beachbody workout? I have the shred, too. she is angry...I had never put my finger on that before. I have been making exercise a daily requirement again and I can't tell you how many times it has crossed my mind that scripture reading should be on that list, too. 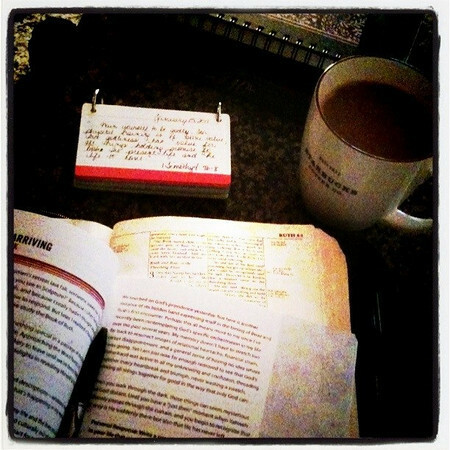 I have some quiet time with God every morning but don't read my Bible nearly enough. And I come here today and read this post and it was like a clear message to me. Thank you for sharing this. I've got the daily exercise down (so far) but not so much with the spiritual time. You for sure are working on the most important part first, and I should be doing that too. And yes, thanks for sharing your struggles because that is real and that is encouraging. I always like to read about your good habits and your not so good habits because I can totally relate. The scale is something to be avoided for the most part, especially when feeling vulnerable and about to be naked. I think you should pat yourself on the back for doing what you can, trying to improve, and keeping your eyes on the Lord! Stephanie: Beachbody.com sells lots of different home workout DVDs, like P90X, etc. We have that (it's dusty though) and I REALLY like Chalene Johnson's programs of Chalean Extreme and Turbo Fire. She also has Turbo Jam that's good too. Thanks for your kind words y'all! I appreciate your "real-ness". thank you for sharing your inner struggles. I am going thru a lot of the same things you are. I don't know how long it's been since I've really prayed...it's a struggle....thanks.